Russian Helicopters Shows VRT 500 Off. Russian Helicopters has unveiled its first lightweight single-engine helicopter, the VRT500, in an attempt to capture a portion of the international helicopter market of up to 2 tonnes. Developed by the manufacturer's VR-Technologies subsidiary, the helicopter features coaxial rotors and has a lift-off weight of 1.6 tonnes. 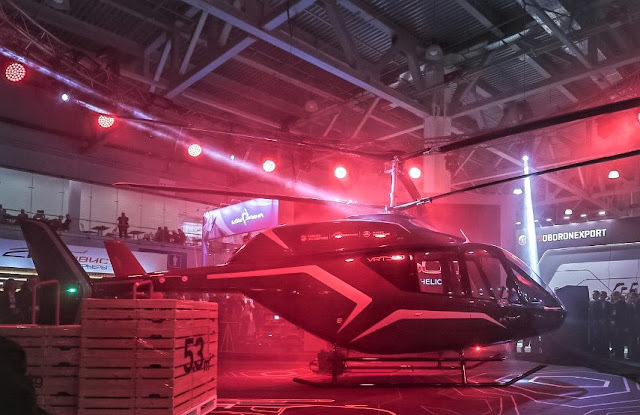 Andrey Boginsky, executive director of Russian Helicopters, which describes the VRT500 as the "largest-scale" helicopter in its class, estimates that the manufacturer will sell about 1,000 units in 2035, which would translate into a 15 percent market share in the category of light. "We see interest in the project by Russian and foreign operators," he says. The five-seat helicopter is designed to carry a load of 730 kg in a range of 860 km, with a speed of up to 250 km/h. The first flight is scheduled for 2019, with the service entrance in 2020-21. Structural tests of the transport system are being carried out, while aerodynamic tests are planned in the short term, says Russian Helicopters. The division of the Rostec state corporation states that the VRT500 will be equipped with a "modern interactive avionics complex". Anatoly Serdyukov, industrial director of the Rostec aviation group, says: "We entered the light helicopter market, for the first time in many years, this market is very competitive, which forces us to increase the quality requirements, reliability and capabilities ". He says that the VRT500 will provide operators with "excellent performance at a high price".